There are many things to love about The Witcher 3: Wild Hunt, and something that often gets lost in the shuffle (ha!) is that it featured one of the best games-within-a-game since Triple Triad made Final Fantasy VIII worth playing. Gwent was so fully-fledged and enjoyable that CD Projekt RED saw fit to give the collectible card game its own standalone release as a free-to-play online experience. 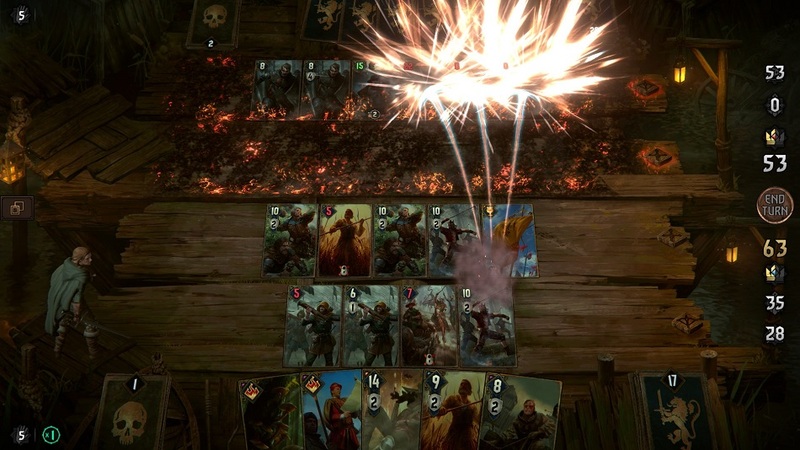 After two years in beta, Gwent: The Witcher Card Game was quietly released in its finalized form last month, along with a hearty single-player campaign called Thronebreaker: The Witcher Tales. Although it obviously doesn’t feature the production values of the mainline Witcher titles, the writing and voice acting are totally consistent with the series’ standards, and the campaign makes a pretty strong case for Gwent being a damn good game in its own right. For those who haven’t tried it, Gwent is a hybrid of collectible card mechanics and tower defense. A player places one card on the table per turn, each with a numerical power rating. By the end of the round, the player with the highest power point total wins. It’s incredibly simple in concept, but made interesting by the countless active, passive and circumstantial abilities of individual units, which can be used to buff friendly cards or attack enemies. Cards are divided into different factions, each with their own play style. The Scoia’tael, for example, tend to favor setting traps and dealing surprise damage over time, while Monsters attempt to overwhelm enemies with large swarms of weaker units. In the multiplayer mode these are all accessible from the start, but in Thronebreaker, we’re locked into the perspective of Meve, the queen of Lyria, as she’s forced to fend off a Nilfgaardian invasion. CD Projekt RED has come a long way in its depiction of female characters since the original Witcher had players scoring trading cards for every woman that they slept with, and Meve is a benchmark of that progress. Middle-aged, battle-scarred, sensibly dressed and in no less than full control of herself, Meve is one of the strongest female protagonists produced by this team or any other. A twist at the end of the first chapter drops her into a desperate situation, and it’s a credit to the writing that we never question her resolve, even as we see through her actions just how taxing it is. Even as someone who hasn’t read the books, there’s no mistaking how detailed and morally complex Andrzej Sapkowski’s fantasy world is, but until now we’ve viewed its political workings through the eyes of the famously neutral Geralt of Rivia. With Meve, it’s great to finally have a more direct stake in events, and to be given a sense of responsibility over the land — even to feel heartbroken and conflicted when it falls to ruin. 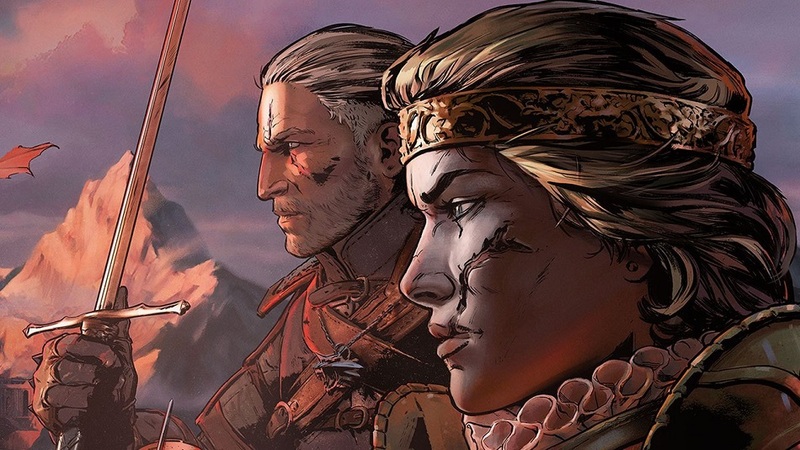 Thronebreaker asks players a string of brutally realistic questions, in which the ‘right’ choice doesn’t always lead to the most desirable results, and sympathetic actions aren’t always met with praise and thanks. When I rid a Nilfgaard-occupied city of its captors, I thought I was doing its citizens a favor. But since I couldn’t spare men to protect the city afterwards, its inhabitants worried that Nilfgaard would only return to punish them. When I saved a seemingly-innocent elf from being lynched, he repaid the favor by secretly poisoning my men. Even if I’m happy with my choices, I also have to consider troop morale, which can affect how well they perform in battle. It all reminds me of The Banner Saga, in that it forces us to face the ugliness of decision-making in times of war and desperation. Tolkien tried to teach us that the world would automatically prosper under a good-hearted leader, but this more recent brand of fantasy reminds us that things are more complicated than that. I’ve been playing Gwent since it entered closed beta almost two years ago, and my fear about Thronebreaker was that it would simply be a set of standard matches against less-savvy AI opponents. That’s thankfully not the case, as CD Projekt RED constantly mixes up the objectives and keeps each encounter fresh and unique. Maybe I need to keep a certain unit alive, or deal with a particular threat within a turn limit. Things get especially creative when unorthodox hazards like rockslides somehow manifest in Gwent form. 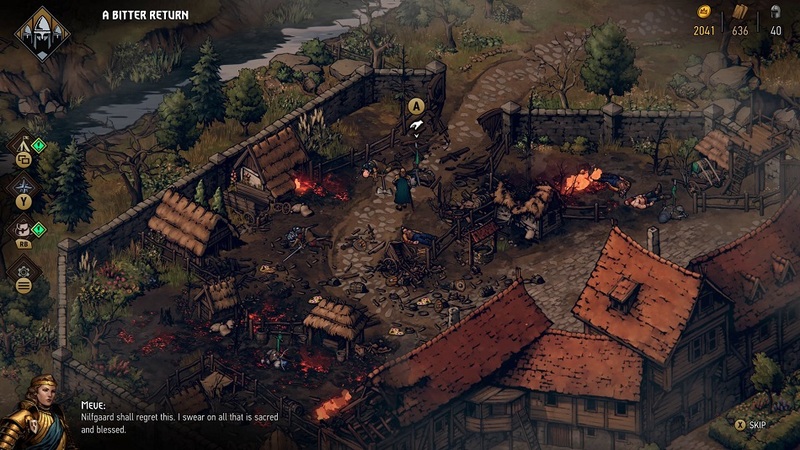 Thronebreaker’s most creative moments are its “puzzle” matches, in which players are typically issued a predetermined hand and must set up a Rube Goldberg-like series of events to bring about a very specific outcome. One recurring riddle forced me to destroy all enemy units with what seemed to be a skimpy hand, but then I read the fine print – one of my cards could instantly kill the unit with the highest power level, and I figured out that if I could raise multiple units to that power level, I could take them out simultaneously. Brain-teasers like that aren’t just rewarding, they make players better at the game and teach skills they can bring into multiplayer. My one major criticism of Thronebreaker is that actually navigating the world is pretty boring. The quest areas are monotonous in color scheme and lack distinctive visual landmarks, meaning I had to constantly consult my map to see where I was and where I needed to go. Plus, the usual rewards for exploration are just the same three resources – gold, wood, and recruits – over and over. As engaged as I was in the battles and story segments, actually getting to those bits was occasionally a drag. Disclosures: This game is developed and published by CD Projekt RED. It is currently available on PC. This copy of the game was obtained via publisher and reviewed on the PC. Approximately 34 hours of play were devoted to the single-player mode, and the game was completed. The multiplayer mode is a standalone game that wasn’t factored into this review. Parents: According to the ESRB, this game is rated Teen and contains Violence, Blood, Language and Crude Humor. 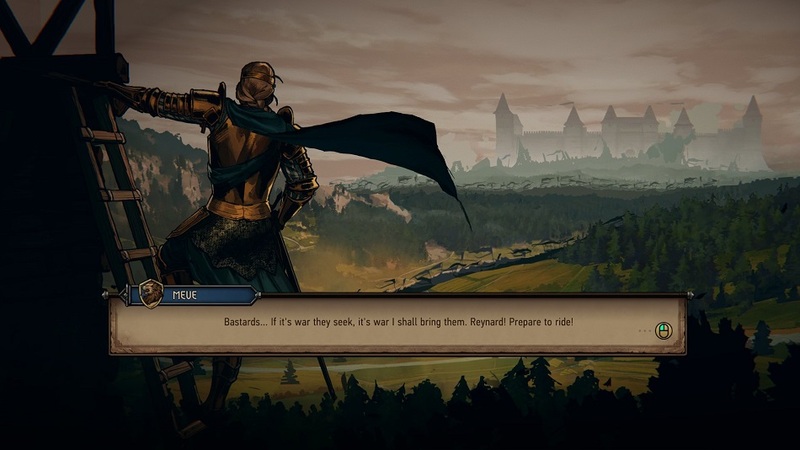 While the game deals with a lot of grim subject matter – the high death toll and moral haziness of war – there’s very little on-screen violence, since the combat is card-based and the cutscenes are generally just static images and text boxes. The worst is when we see the aftermath of a raid or battle, but even then, it’s nothing graphic. It’s far more appropriate for younger players than the mainline Witcher games. Deaf & Hard of Hearing Gamers: All important dialogue is text-based, and sound cues are never vital. The character barks a sound whenever a card is played and isn’t subtitled, but they’re unimportant to successful play. Remappable Controls: No, this game’s controls are not remappable. The game is played entirely by pointing and clicking with the mouse.